Need some birds up in the air that look like they are going somewhere? 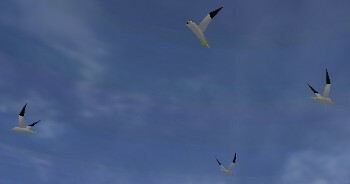 This pack includes one file with 4 birds (Birde avatars) each flying in a different direction. Whatever you select as your base object, the birds will be placed 80 meters above that. The birds may all disperse at the same time from the starting point, so you may want to put a small wait time on the moves to stagger the birds flying patterns. Also, if you would like to make them fly in a different direction, simply rotate the bird to face it. Also, if you don't want them to be in a clump, just grab them with your mouse (hold down right click on them) and just toss 'em away somewhere else.